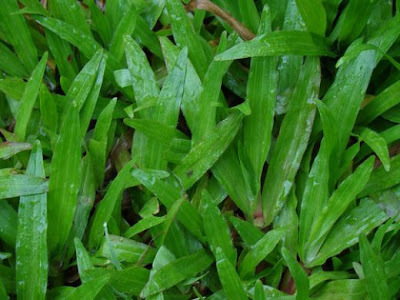 The carabao grass is a kind of grass that is very common in the American tropics and tropical countries especially in Southeast Asia. It can be found in abundance in countries like the Philippines, Indonesia and the Pacific islands. The grass originated from the American tropics and is eventually naturalized in other tropical nations all over the world. It has a scientific name of paspalum conjugatum bergius. It is also often referred to as buffalo grass. Indonesia, Malaysia, Thailand and the Philippines have varying terms for it. In Indonesia, they call it either jampang pahit or paitan. In Malaysia, rumput ala negri or rumput kerbau. In Thailand, ya-hep or ya-nomnon. And in the Philippines, the Tagalogs call it kulape, the Ilocanos call it kalo-kawayan and the Visayans refer to it as kauat-kauat. It's a stoloniferous grass. It vigorously creeps on the ground with long stolons. As it spreads through the ground, roots will form at the nodes. This allows the grass to branch out quickly. The leaves are flat, thin and narrow. Although the carabao grass is considered by many as a pesky weed, it has many valuable uses especially in the agricultural sector. A lot of farms use the grass as forage for grazing. Almost all types of livestock consider the grass as food – goats, horses, cows and sheep. It not only provides food for livestock, it is also a great ground cover. It helps prevent open areas from turning into barren,dry lands. Some rice and coconut plantations regard the grass as an important weed. It helps keep balance in the field. Another very common use of carabao grass is in the landscaping industry. It's a very popular cover for lawns and gardens. 1. In Africa, the leaves of the grass are used to treat pulmonary illnesses, stomach aches, fever and debility. The roots on the other hand are used to treat dysentery and diarrhea. 2. In Congo, the leaves are combined with other ingredients to produce a vapor bath believed to be effective against fever. 3. In Trinidad, the use the leaves for fever treatment. 4. In Ecuador, leaf infusions are used for headaches. 5. In Gabon, the leaves are pounded then mixed with another ingredient from another plant then used as a compress for sprains, contusions and joint dislocations. 6. In Cameroon, the leaves are softened using hot ashes, pulverized in water then utilized to alleviate dysentery. 7. In Malaysia, leaves are grounded then used as wound paste. 8. In Zaire, the carabao grass is used as an antidote against venom and poison. A decoction of the whole grass is mixed with oil from another plant and then rubbed on the bitten part of the body. The most common way to avail of the grass is purchasing them in tiles. Your best option will be to go to a landscaping store near you. The grass is already grown so all you need to do is place the tiles in the sections of the ground you want to cover. I'm not very sure if there are carabao grass seeds that are available commercially.